Sunday Funnies: Was the Heritage Foundation a Communist Front in the 1990s? DISCLAIMER: I do not believe in the individual mandate for free market reasons, it’s a way for impose insurance companies on the lives of more people. This week, during the GOP debate in Nevada, the Republican candidates finally had to admit the truth about President Obama’s healthcare reform plan and its individual mandate. The conservative think-tank The Heritage Foundation, with the downfall of the Soviet Union and the competition out of the way, promoted socialism as early as 1989. I know, a shocking revelation. Self-styled Conservatives, promoting “Big Government,” who knew? The Wall Street Journal has the details here. Unmistakeably, this is a blow to the legitimacy of Newt Gingrich or Mitt Romney as conservatives opposing “Obamacare. Meanwhile, the Tea Party and it’s soon-to-be candidate, Texas Governor Rick Perry have consistently considered an ‘individual mandate’ as a form of socialism—something I do not even know the definition of anymore. Its just so funny to see “anti-red” conservatives squabbling over whose the socialist. Can’t say Obama is the communist marxist secret Muslim anti-Christ anymore, can they? (that’s a reference to Uncle Ruckus of The Boondocks) Quick, someone alert Craig Carter of this new Communist threat! This entry was posted in Political Jesus and tagged conservatives, conservatives do not like historical facts, Craig Carter, humor, national healthcare, socialism, socialized medicine, Sunday funnies, Tea Party on October 23, 2011 by Rod T.
Michele Bachmann Benefitted from Socialism, so why shouldn't you? It’s rare that I agree with Larry O’Donnell of MSNBC, but I think he makes a great point. Since Tim Pawlenty and Michele Bachmann claim to be “economic conservatives” but still support subsidies for the farming industry in Minnesota, it’s fair to say these “conservatives” have benefited politically from socialist policies. This entry was posted in Political Jesus and tagged economics, Libertarianism, politics, socialism, Tea Party on June 29, 2011 by Rod T.
BREAKING NEWS: John Howard Yoder Joins The Tea Party! “I mention this because Tooley’s paragraph above makes clear that Yoder’s influence was to train a generation of younger Evangelicals to hate and despise their own cultural heritage – to reject as violent, colonial, patriarchal and racist the legacy of Western Christendom over the past 1500 years. By doing so, Yoder helped create a void into which cultural Marxism could move. Marxism Has been in the process of colonizing the ecclesiastical structures of a dying Christian faith in the West for over a century now. As faith in Jesus Christ declines, Marxism offers a modern, this-worldly substitute complete with eschatology, guilt, martyrdom, holy books, a prophetic stance and much more. This is part of the explanation (which of course is far more complex than this one little point) for why the Evangelical became “Left” politically and economically. And it explains why those who first embrace economic Marxist theories are so susceptible on all the other “culture war” issues: sanctity of life, traditional marriage, sexual morality etc. There is a connection between rejecting one’s cultural traditions, embracing the sexual revolution and using Marxism to criticize capitalism. These three moves fit together and reinforce one another. I take issue with this quote for many reasons, but overall, to invoke a critique of Yoder and therefore advocates of Christian non-violence as pushers of some Marxist pill both is quite unneccessary and gives us a false choice between only 2 alternatives, supressing other possibilities. Better yet, rather than placing words in Yoder’s mouth, without providing quotes or sources, one does better to quote Yoder himself through a close and faithful reading. 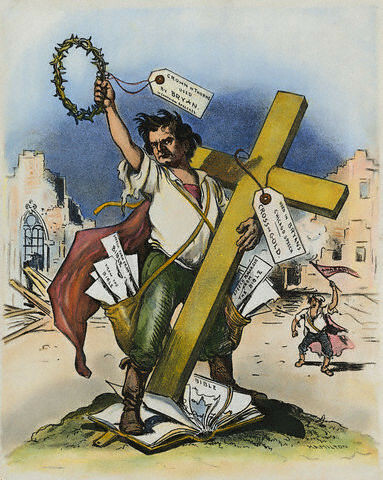 Yoder was no socialist, and it is true that his Politics of Jesus was geared toward addressing the state and the issue of the Sword (war and policing powers of governing institutions). However, Yoder does give somewhat of a small, small glimpse of his view of economics; I would argue that his vision provides an insufficient account of the Coin (the ruling authorities power to determine the means of making a living, employment, vocation, etc.) but there are shades of his attitude towards money in his work. Especially in the chapter of POJ, “Revolutionary Subordination,” whenever one discusses the issue of slavery, women’s roles, and Paul’s “household codes,” you are discussing economic issues, case studies in ancient views toward household management. Now, this post may come to a surprise to my peers who condemned last year my economic views and claimed that it was contrary to Yoder’s own, and at first, I conceded their points, but today, I take that concession back. In fact, Yoder comes close to my own views in a relatively shocking way. In fact an honest, economic close reading of Yoder’s The Politics of Jesus would seem to suggest that he was not into Craig Carter’s crony corporatism or some of Yoder’s post-modern fan base who run theo-blogs and promote the doctrine of “Outside Democratic Socialism, there is no Salvation.” I would proffer that the ruling principle in Yoder’s work is that Jesus the Non-Violent Liberator is the governor in every area of our lives. Upon reading this quote, one has to wonder exactly where Yoder has left room for Marxism, if Yoder himself abandons both socialism and capitalism, and rather suggests the economics of Jubilee. For even in a communist state, debt is the problem (and I would add both in terms of deficiencies of political power and wealth). John Howard Yoder is protesting the, as J. Kameron Carter mentioned, the debt-bound subject. I would suggest that the hidden monster in today’s U.S. political economy that we do not talk about (and allow the Dave Ramsey’s of the world to roam free from criticism–especially in the Church) is the enormous amount of debt that individuals and families accumulate, as they sacrifice themselves on the alter of the American Dream to earn a living. That is a topic for another day (and I can envision adding Booker T. Washington to that conversation), but Yoder’s concern is the ability of institutions (the Powers) to control where our bodies go (politically) but one can see in the aforementioned chapter that Yoder has an eye for economics. JHY understands YHWH’s Prayer in Luke, where Jesus asks for us to forgive us our debts (in the greek, opheleima, literally monetary debt, as a request by the disciple to ask God to give God’s people the power to practice Jubilee [see Leviticus 25] (page 62). The remission of debt, besides destabilizing the political economic by practicing the virtue of forgiveness, also serves as a constant reminder that God is the OWNER (kyrios in the greek has this at its meaning as well) over all of Creation. I side with liberationist thinker Joerg Rieger in that it would be completely inaccurate to even consider ourselves even the debtors to God concerning our property, for a debtor has the agency to choose how much to repay the lender. Christologically speaking, we should see EVERYTHING as God’s Property [a subversive reading of that 1990s Gospel choir’s name], all of creation (humanity, “our” bodies and God’s creation), even all of our so-called choices (by the way, choices has become such a passe concept, that one can’t help by think about consumption–thus the pro-choice movement in reproductive rights–economics, bodily existence–that is the abortion debate). The commitment to ursury in modern times starts with Christian traditions, and in particular, the Reformed tradition of H. Richard Niebuhr, Abraham Kuyper, and Herman Dooyeweerd, all three whose politics I have suggested a while back that are very much so Constantinian to the core. It is not a coincidence that all three men wrote against Anabaptist practices, as the Reformed forefathers would have, but the problem with notions such as “sphere sovereignty” is that any institution can be considered to have moral “autonomy” (freedom of choice) apart from the Lordship of Christ Yeshua. JHY’s notes in the chapter “Christ And Power” suggest that his project is a rebuttal to the Reformed Tradition’s historic polemic against non-violent Christianity (see for example page 144, note 7.). The problem I have with a vast majority of libertarian/conservative Christians is that they presuppose this “sphere sovereignty” rather than Jubilee economics as the foundation for a Christian vision of the Coin. The reason why Greed is the great sin is because the greedy presuppose that anything of YHWH’s good creation is theirs to begin with. On the other hand, liberationists who remain focused economic sin, do not provide an adequate account creation, and humanity’s co-creative capacities in the making of the world’s economies. I believe this is where Yoder is most helpful in that while he fails to address the Corporations and Coin as Powers specifically, there are some aids in the struggle against poverty. According to Yoder, Jesus calls the faithful to go beyond what is required, even what governments require. If one thinks about it, the IRS gives individuals and corporations tax breaks for charity, and provides various loopholes to escape the wrath of the tax collector. Would Yoder consider even these practices wrong? I do not know for sure, but an economic reading of POJ suggests perhaps. Yoder’s attack on the debtor society also matches the post-colonial concern for dependency abroad, that wealthier nations “help” poor nations and keep them poor with their loans. But imagine a world where all of these loans were forgiven every seventh year? Disruptive, yes? This approach to economics is what I think is needed today; what it means for non-violence as the guiding principle in money-changers’ houses, I am only beginning to scratch the surface. But I think this reading is consistent with Yoder’s commitment to non-violence, relying on the God of Israel & Judah & Jesus, to fight our battles for us, even during times of recession. This entry was posted in Political Jesus and tagged corporatism, defending capitalism and the status quo, economics, Marxism, socialism, The Economy of Jesus on May 7, 2011 by Rod T.